Triphala is recommended and used more often than any other Ayurvedic herbal formulation. It is popular for its unique ability to gently cleanse and detoxify the system while simultaneously replenishing and nourishing it. In Ayurvedic terms, triphala, used in moderation, is said to have a beneficial effect on all three doshas—vata, pitta, and kapha. It is most well-known for its gentle effects on the bowels, improving peristalsis and cleansing toxic build up of wastes; but Ayurveda also views triphala as a nourishing supplement known for its ability to rejuvenate healthy tissues, allowing one to age gracefully. Triphala is also traditionally used as a tonic in hair and eye washes. 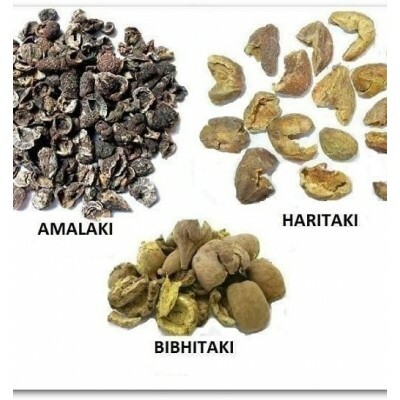 The traditional way of ingesting triphala is as a tea. This method allows one to taste the herb fully, and taste is considered by Ayurveda to be an important part of the healing process. Taste starts the digestive process, and sends signals to the body as to what to expect, already initiating your body’s own inner pharmacy. To take triphala as a tea, make a decoction by adding ½ teaspoon of triphala powder to a cup of hot water. Stir and allow the tea to cool, and drink. Triphala contains five of the six tastes recognized in Ayurveda (sweet, sour, bitter, pungent, and astringent), only missing the salty taste. Perhaps because the Western diet is so lacking in bitter and astringent, these are the two most prominent tastes for most people, which can make drinking the tea somewhat unpleasant initially. Over time, as the system becomes more balanced, it is not uncommon for the taste one perceives to evolve into a sweet experience. Triphala is usually taken on an empty stomach, most commonly in the evening before bed. Some prefer to take it first thing in the morning, especially if taking it at bedtime makes one urinate at night. Triphala liquid extract provides an alternative method of taking triphala. It's convenient, easy to assimilate, and has a long shelf life. This extract is made from the same certified organic fruits used in making the herbal tablets and is extracted using non-GMO, gluten-free grain alcohol. A typical dose is a dropper full (about 30 drops) taken in 1-2 ounces of water or juice, one to three times daily, or as directed by your healthcare practitioner. For men and women across the world, hair thinning and loss of hair is a common issue. This mainly occurs due to a sedentary lifestyle, poor diet and improper functioning of the physical organs. Ayurveda, an age-old medical treatise of India, contains powerful solutions for hair loss problems. Triphala is a natural hair loss remedy that has been mentioned in this treatise, and it has long been used by traditional Ayurveda practitioners. Its usage has lasted to this day, and it is available in the form of capsules, tea and even as powders. If you are suffering from hair problems such as hair thinning, hair fall, baldness or more, you can try this amazing remedy and benefit from it. How Does Triphala Powder Work for Hair Loss? 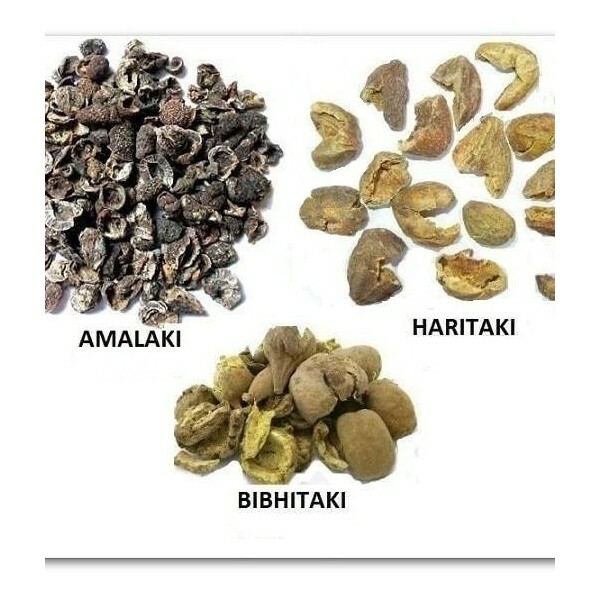 Triphala is an amazing preparation in Ayurveda, and consists of three fruits – Amalaki (Emblica officinale), Bibhitaki (Terminalia chebula) and Haritaki (Terminalia belarica). Each of these fruits is a very effective health enhancer and the combination is regarded as a very powerful herbal preparation. It has multiple benefits for the body. It works on the entire body and improves its various processes to be useful in treating hair loss problems. It is a great antiviral and antibacterial medicine. It can boost your overall immunity, and work like a laxative. It helps detoxify your body and protect you from various types of disorders. It has been proven that people who do not have their bowels clean suffer the most from hair loss problems. Triphala works as a potent laxative and can clean the bowels, thus minimizing hair loss. Triphala prevents the formation of any free radicals in the human body and has powerful antioxidant effects. It is this property that allows it to prevent signs of premature ageing, such as graying of hair and formation of wrinkles. 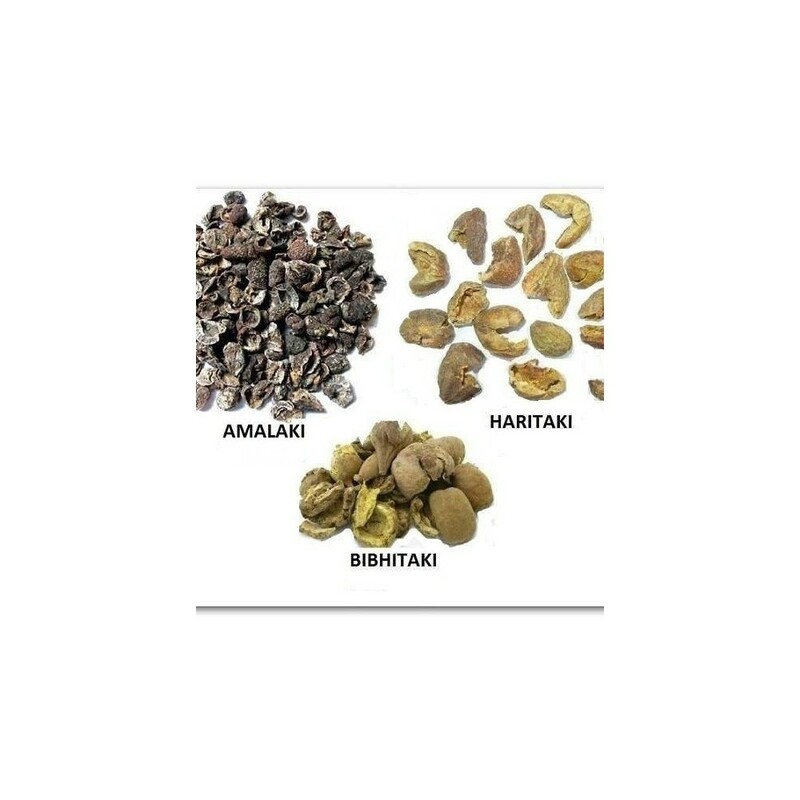 The presence of Amalaki in Triphala is known to boost proper circulation of blood and assist in a proper absorption of various minerals that are important for maintaining healthy hair. It is rich in Vitamin C, which is important for boosting the immunity – which in turn helps prevent premature graying of hair. Bibhitaki helps in making the roots of the hair stronger, minimizing hair fall and preventing premature graying of hair strands. How to Use Triphala Powder? You can use Triphala powder to wash your hair. You can grow your hair with the application of Triphala powder and Aloe vera. You can add some of the powder into warm water and form a paste. Apply it directly on your scalp and wash it off after some minutes. In case you have an oily hair, you should wash your hair regularly with Triphala powder. It can be a perfect alternative to many commercial, over-the-counter shampoos which contain strong detergents that have a damaging effect on hair. Triphala powder contains all-natural ingredients and does not cause damage to your hair in any way. Triphala can be consumed orally, ingested with warm water or taken as a capsule. However, powdered Triphala is said to be more effectual and has a faster action on the hair.